Complete with a fresh toner cartridge! Units that cost under a penny a page to operate! THIS SPECIAL was just $299.95! 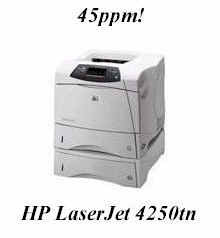 HP LaserJet 4050: 17ppm BUY NOW for only $249.95! 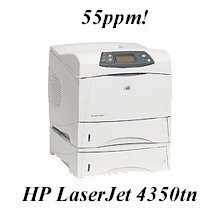 HP LaserJet 4050N, A real workhorse, great for the small business looking to keep costs in check. This unit comes with 500 sheet regular paper tray and a fold down multipurpose paper tray that holds 100 sheets of paper or 25 envelopes, and a print speed of 17ppm. This unit has a 90 day warranty and comes with a full High Yield (10,000pg) Anderson Technologies rebuilt toner cartridge (a $69.95 value for free!). If a network card is needed add $49.95 to the already low price of $249.95! Throw in an extra paper tray for only $79.95! 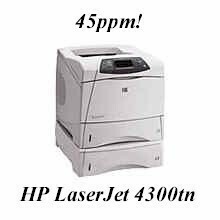 The LaserJet 4000/4050/4100/4110 all look almost identical the only real difference is print speed. The (N) stands for Network ready, (D) means Duplex capable, (T) means two standard (500 sheet) paper trays. THIS SPECIAL was just $359.95! Specs BUY NOW for only $299.95! 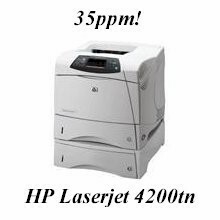 HP LaserJet 4100, Another great workhorse, ideal for the small business looking to keep costs in check. Comes with a 500 sheet regular paper tray and a fold down multipurpose paper tray that holds 100 sheets or 25 envelopes, print speed of 25ppm. This unit has a 90 day warranty and comes with a full High Yield (10,000pg rated) Anderson Technologies rebuilt toner cartridge (a $69.95 value for free!). If a network card is needed add just $49.95 to the already low price of $299.95! Xerox XC810, A real nice unit for the small business looking to to stay with the basics. comes with 250 sheet regular paper tray, a legal size scanner. Print speed of 17ppm. This unit has a 90 day warranty and comes with a new drum unit and full Anderson Technologies rebuilt toner cartridge (a $169.95 value free!). 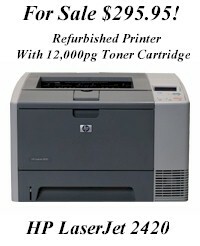 We have 1 of these units left in stock, HP LaserJet 3330MFP, Printer/Copier/Scanner & Fax ALL IN ONE!! Another great value! Ideal for the small business looking for a machine that does it all. Comes with a 250 sheet regular paper tray, manual envelope feeder, print speed of 23ppm, copier/scanner Auto Document Feeder that holds up to 50pgs, with a 'legal' (14") size flat bed scanner. This unit comes with a 180 day warranty and with a full High Yield (4,000pg rated) Anderson Technologies rebuilt toner cartridge (a $59.95 value free!). NEW SALE PRICE $299.95! Missed one of these great printer deals? We have more printers for sale so call, fax, or email us and we'll satisfy that urge for a printer at a price you can be happy with! Check out these Low Cost deals! We have a couple in house ready to go. 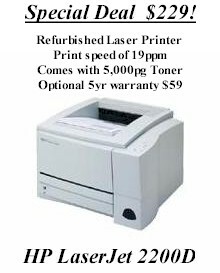 Get a 5 year warranty with this refurbished printer for free! !